Designed for use with the Ninja Pan/Tilt Camera Base, the X10 ScanPad Ninja Pan Tilt Remote Control provides complete control for up to four X10 surveillance cameras. The remote provides pan/tilt control, as well as automatic positioning for each camera via stored positions. 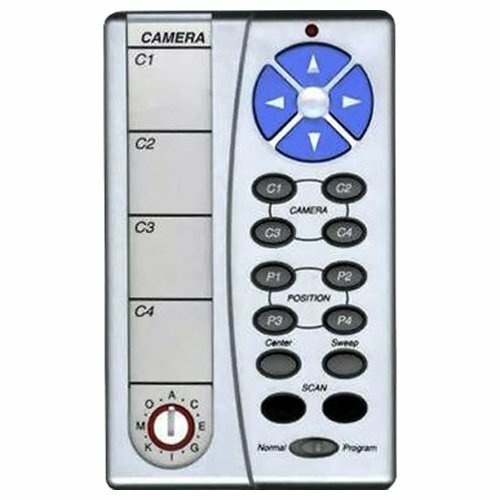 Simply press the programmed button, and your corresponding camera will automatically go to your stored position. You can also "reset" the cameras to the center position, or automatically sweep through all four of the stored camera positions. Although the X10 ScanPad Ninja Pan Tilt Remote Control can be used to turn on X10 modules using unit codes 1 to 4, the remote cannot turn them off or dim/brighten. Consequently, this remote is recommended for use with X10 cameras only. NOTE: When used with multiple cameras, the remote requires an X10 transceiver module (sold separately). If you have any questions about this product by X10, contact us by completing and submitting the form below. If you are looking for a specif part number, please include it with your message.